Superfood Hot Cocoa - dairy free & delicious! Once the weather starts getting cold, the amount of hot beverages I consume on a daily basis multiplies by at least 5. Today, I’m sharing my new obsession: Superfood Hot Cocoa, a creamy dairy-free potion that will fortify your immune system all while warming you up from head to toes! Winters in New England are hard, even more so if you’ve spent more than half your life in the warm climate of Dominican Republic. Sure, I’ve lived in the Northeast for the past seven years, but somehow still can’t get used to the impending cold weather that arrives every November. The kitchen becomes the warmest place in our home, where making batches of treats and whisking up hot beverages is what keeps me alive – quite literally. 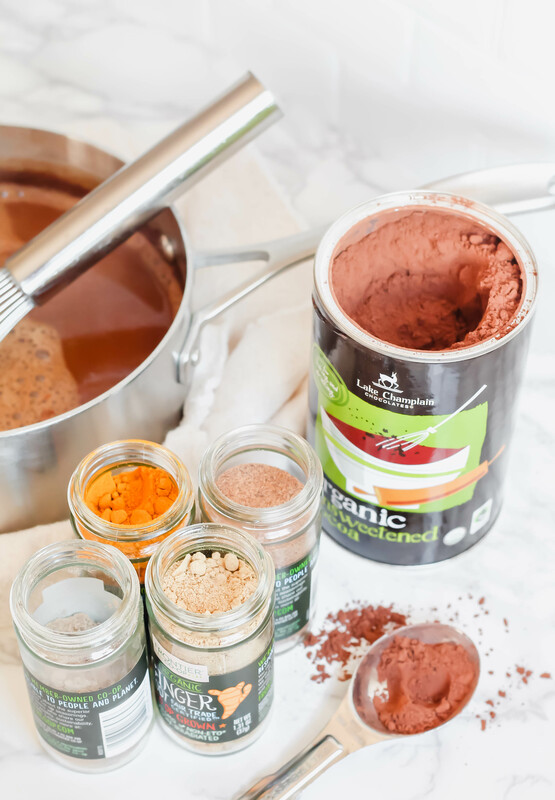 That’s where this Superfood Hot Cocoa recipe comes in – partnering with my friends over at Fair Trade USA, I’ve created a recipe that not only will keep you warm, but thanks to its ingredients, it becomes a healthy potion that will keep you healthy throughout the winter! Well, let’s go through these fair trade ingredients and discuss what they can to to keep you healthy! P.S. Remember I’m a chef and food writer, not a doctor, so always consult your doctor if you’re unsure about an ingredient in a recipe. Why is this a superfood winter drink? Starting with a non-dairy cashew beverage, this is a simple vegan hot cocoa that will be loved by the masses. Cashews are packed with selenium and magnesium, two nutrients I try to get daily since they are great not only for relaxing and stress relief, but also selenium is my go to supplement for gorgeous skin, hair, and nails. Organic cocoa powder is also packed with magnesium, continuing on that stress-free life goal, but fabulous for lifting your mood and some say it works as an anti-depressant even! Now, adaptogenic powders, let’s quickly chat about them. They’re normally mushroom based, since mushrooms have withstood the test of time in what is health benefits – it’s a quick way to get a good dose of antioxidants and reinforce your body of them. You can find them at any health food store. For the spices, everything is just incredible for you: turmeric and black pepper, cardamom, nutmeg, and ginger are all spices I routinely keep in my pantry for daily use. 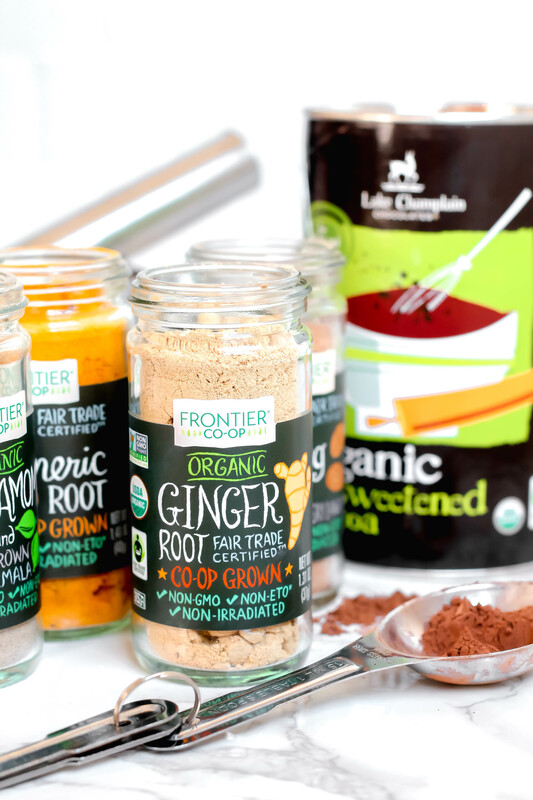 As you can see, I’m obsessed with Frontier Co-Op spices for all the right reasons: fair trade, non-GMO, and organic – but best part is they are so fresh and taste incredible in my recipes! Starting with turmeric and it’s anti-inflammatory properties (the black pepper is used to activate the turmeric, so don’t skip it! ); cardamom, who in the ginger family also helps with settling your stomach after a big meal; nutmeg, an all-star spice that for generations has been used to treat insomnia; and ginger, another anti-flammotary and tummy-friendly spice. As you can see, not only is this hot cocoa recipe delicious, but it’s my go to dessert after a big meal at home when I’m craving something sweet but don’t want to overindulge. This Superfood Hot Cocoa recipe will not only help my sweet tooth relax, but will help my entire body rest, digest, and put its best foot forward this season. The best part of the entire recipe is that the ingredients are fair-trade, which gives me peace of mind knowing farmers are being paid a fair wage for their harvests. Spices, cacao, nuts – they’re all incredible products when sourced correctly and knowing a product is fair trade makes me even more so inclined to continue purchasing. You can learn more about fair trade products and how to incorporate them more in your life by checking out the Fair Trade Certified website! In the recipe below, I’ve used a few of my favorite fair trade supporting companies, including Pacific Foods, Lake Champlain Chocolates, Frontier Co-Op Spices, and Wholesome Sweet sugar. This super creamy and delicious hot cocoa is packed with good for you ingredients to not only make you feel warm, but healthy as you drink it! Chill the can of coconut milk overnight. In a sauce pan, simmer the cashew beverage until warm and add cocoa powder, spices, and sugar. Whisk and bring to a slow simmer. Remove ¼ cup of the liquid and in a small cup, dissolve the cornstarch in this. Pour it back in and whisk vigorously until creamy. Serve hot in mugs - to make coconut whipped cream, remove the top solicited coconut milk and whisk with blender, food processor, or immersion blender until fluffy. Top hot cocoa with coconut whipped cream and enjoy! Disclaimer: Fair Trade Certified sent along complimentary products for me to create a recipe with, but I was not compensated to share this. I believe in the fair trade movement and love to support it any way I can – whether with recipe blog posts or my hard-earned cash at the grocery store.